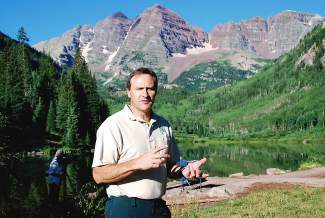 In this photo from 2010, Scott Fitzwilliams, supervisor of the White River National Forest, stands at the popular Maroon Bells near Aspen. As firefighting costs come out of the Forest Service budget, the service has found it difficult to staff and carry out necessary projects. 52 percent: Portion of the 2015 U.S. Forest Service budget dedicated to wildfire fighting. 16 percent: Portion of the 1996 U.S. Forest Service budget dedicated to wildfire efforts. 50 percent: Decline in the White River National Forest budget from 2008 to 2015. 30 percent: Decline in the White River National Forest’s full-time staff in that time. EAGLE COUNTY — Trees don’t vote. If they did, the U.S. Forest Service wouldn’t be facing the kind of budget crunch it does. The numbers are daunting: Since 2008, the budget of the White River National Forest — which includes the Eagle and Holy Cross ranger districts in this part of Eagle County — has dropped by 50 percent, from about $30 million to about $15 million per year. The decline is due almost entirely to the amount of money the Forest Service puts into firefighting these days. Since 1998, firefighting has consumed an ever-greater portion of the agency’s budget, growing from 16 percent to 52 percent of Forest Service spending each year. That decline comes although the White River National Forest hasn’t yet been struck by the gigantic fires seen elsewhere on the nation’s public lands — the problem is that as firefighting costs grow, the money is siphoned out of the budget of every office. That loss of money has affected virtually every other operation run by local and regional offices. Aaron Mayville, the interim district ranger for the Eagle and Holy Cross ranger districts, said those offices have about one-third fewer employees than they did just a few years ago. Just as an example, the White River National Forest once had several law enforcement officers — rangers who are also police officers — to help keep the peace on the forest. Today there are three. One of those officers works the combined Eagle, Holy Cross and Aspen ranger districts. That’s about 1.5 million acres. The lack of people also affects how much work can be done in the forests. And, with nearly 2.5 million acres and as many as 15 million visitors per year — more than the combined annual visitors to Yellowstone, Yosemite and Grand Canyon national parks — there’s a lot of work to do. That’s why forest users have lent a number of helping hands. The most recent effort was put together by the Vail Valley Mountain Bike Association and the Vail Valley Trails Connection. Those groups reached out to communities, including towns and metropolitan districts, as well as private donors via a GoFundMe page on the internet. In about 10 weeks, the groups raised around $50,000 to fund a seasonal employee who will help coordinate trail maintenance and restoration efforts. Lee Rimel, who has worked with both community groups and the Forest Service, said that work will also include restoring unauthorized trails in order to keep people from using them. “It’s a major part of this work to eliminate those trails,” Rimel said. While raising $50,000 in a matter of weeks is a big step, Rimel said the fact the money came so quickly is no surprise. “Our challenge going forward is to continue raising funds to supplement the Forest Service budget so they can continue to hire a ranger who can focus on trails,” Rimel said. Ideally, that person would work full time, Rimel said. But that would require more funding. The work on the forest isn’t just on the nearly 600 miles of trails in the local forests. Above Red Cliff, a team of 40 groups and individuals has been working with the Forest Service to restore the Camp Hale area. That valley was home to the 10th Mountain Division during World War II and for several years after. To make a home to train soldiers, the Army Corps of Engineers straightened the Eagle River and drained wetlands. There’s also still a good bit of unexploded ordnance in the nearby hillsides, and many of the buildings used asbestos insulation. In short, it’s an ecological mess. The Forest Service, the National Forest Foundation and other groups are working on a plan to put the meander back into the river, create as much as 300 acres of new wetlands and clean up other environmental damage on and around the old base. The work for that plan will be expensive. Marcus Selig, regional director of the National Forest Foundation, said the price tag could be anywhere between $10 million and $30 million. The Forest Service simply doesn’t have that kind of money. Selig said fundraising will focus on private and corporate donors, but he acknowledged that people may not be willing to open their wallets quite that wide. The Forest Service could become a major player in the Camp Hale effort if it could keep the roughly $10 million per year in profit it generates, mostly from ski area fees. Now, that money goes straight in the general treasury, although Mayville said there are efforts in Congress to help free up more money for the agency. Until that happens, the Forest Service will have to rely on community help. Kim Langmaid, founder of Walking Mountains Science Center, said those partnerships are critical to Forest Service operations. 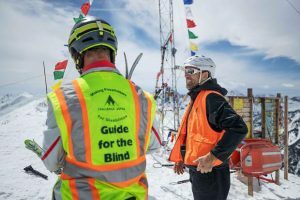 That help includes Walking Mountains’ contributions to educational aspects of Epic Discovery, Vail Resorts’ summer program. Those efforts might just help more people understand the importance of public land management. The need for that kind of help is frustrating for Mayville and others.